Are you getting ready to go out (or stay home, as it were) and watch the Manny Pacquiao-Adrien Broner fight? If you are, maybe you are wondering where you might be able to place a friendly wager on it. Well, it’s not necessarily the policy here at Boxing Insider to be promoting the online sportsbooks, but we can give you an idea of which way the wind is blowing, and then you can get over to a service like Oddschecker and find out the numbers from all over the world. For certain, it looks as if the Pacquiao money has been coming in over the last few days. There are a few books, in fact, that have him as high as -400 (where you lay 4/1), and we see some -350 out there. But we can say with some conviction that everybody has him at least a 3/1 (-300) favorite. And that was not the case earlier in the week. As far as the price coming back on Broner, we’ve seen mostly anywhere from +250 to +270, although you can find a better price if you like him. We have seen one US-facing site (i.e., one that services customers from the United States) that has him priced at +300. So perhaps, if you are a Broner backer, this is as good a time to strike as any. Then there is the Over-Under. And it goes without saying that if you really search, you can find a price on just about any distance you’re looking for. The standard is 10.5 rounds (i.e., the 1:30 mark of the 11th – don’t get confused), and the consensus, as we have found it, is a -300 price on the “over,” although one prominent destination had it -250 when we last looked. As far as the “under,” we’ve seen a price as high as +240. If you don’t think the fight is going the distance, and want to get particular about it, there are a lot of ways to go. For example, you can wager on either fighter ending things in a specific round or group of rounds. To illustrate, Pacquiao has been posted at one random sportsbook we looked at +1100 (11/1) to win in the group of rounds 4-to-6. And the exact outcome is also a subject of much action. For Pacquiao to win by decision or technical decision (where a cut or injury ends it and they go to the scorecards), it is basically an even money proposition, although you would have to lay a small price (-105 or -110) at a few places. As far as Pacquiao ending things inside the distance (KO or TKO, and also including a DQ win), we’ve seen a +300 (3/1) price out there. As the underdog, Broner gets higher prices than that, naturally. For him to win on a decision or technical decision, the best number we saw was +575, although mostly you’re looking at anywhere from +450 (9/2) to +500 (5/1). And the “Broner by KO, TKO or DQ” prop carries a +650 consensus, though we do see +700 sprinkled around out there. Then there is the more unusual stuff. If you want to wager on either fighter getting knocked down and then coming back to win the fight, prices on that kind of thing are available. We looked at one sportsbook outlet where Pacquiao was +800 (8/1) to do that and Broner was +2100 (21/1). And there are a few select places where you can actually bet that BOTH fighters will hit the deck, and we’ve seen both 6/1 (+600) and 7/1 (+700) for that. 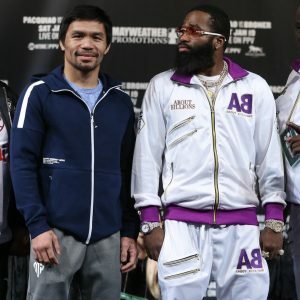 In what is being called “Gone in 60 Seconds” but could also be referred to as the “Don’t Go to the Refrigerator” prop, there are prices out there on both Pacquiao (150/1) and Broner (200/1) to end the proceedings within 60 seconds. My own personal opinion – play this prop and the only thing gone in sixty seconds would be your cash.